Hello Source readers. I was away for a bit, enjoying some low-cost/free fun on our public lands. First order of business upon returning: thinking up a half-decent name for the daily transportation headlines, as attempted above. Second order of business: a few transpo- and infrastructure-related thoughts from my journeys…. •I spent the bulk of my time in Oregon, Idaho, Wyoming and Utah. Total population of those four states is a little more than nine million people and those four states combined cover about 365,000 square miles. Los Angeles County alone has more than 10 million people, seven million registered vehicles and covers 4,752 square miles. To repeat: L.A. County has more people than four giant Western states combined. Cray cray! 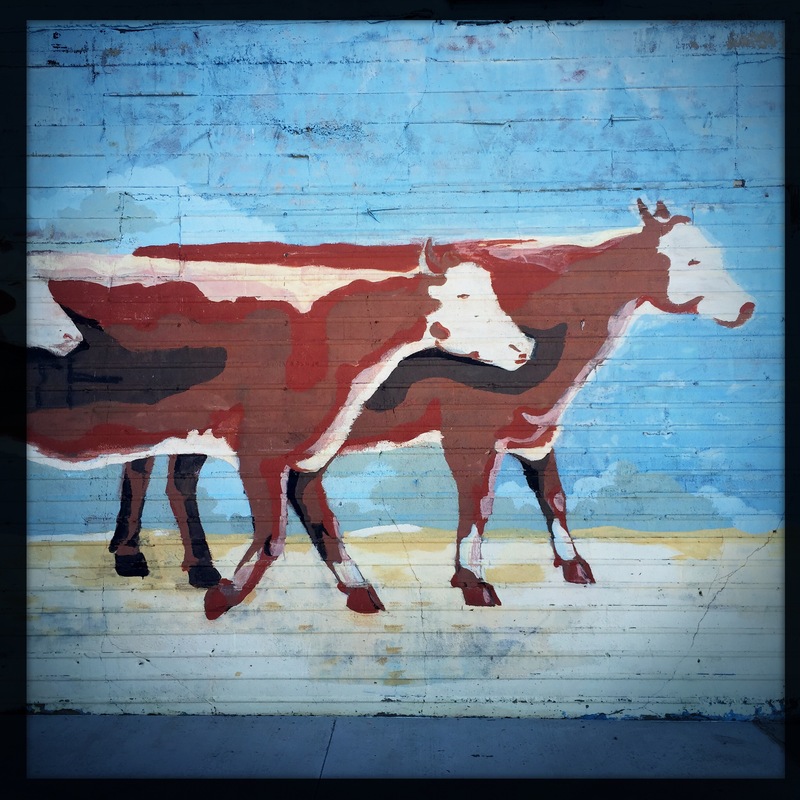 In Wyoming, there’s two cows for every one person. Photo: Steve Hymon. •The car may be the reputed king/queen of Los Angeles County, but it’s the king/queen pretty much everywhere else, too — even Portland and Salt Lake City, which have invested heavily in transit over the years. Traffic, traffic, traffic was everywhere and big, ugly commercial strips prevailed most everywhere. Perhaps the most shocking traffic quagmire I encountered came in Jackson, Wyoming, which seems to have succeeded in becoming Gatlinburg West. That’s not a good thing. Perhaps the weirdest thing: the heavy traffic on the 15 freeway from north of Salt Lake City all the way to the Inland Empire. Obviously the stretch of freeway between Las Vegas and San Bernardino has long been terrible, but it feels the whole stretch of the 15 is one big extension of Southern California. My geewillickers, it’s a crime of some sort that in the 21st Century there’s no train that can transport people between L.A. and Vegas in three hours or so — a reasonable time for that journey. Sigh. •As for Portland, it’s nice to see the rail and streetcar system continue to expand, but it’s also interesting that many neighborhoods not adjacent to rail — but served by frequent bus lines and good bike lanes — are gentrifying or attracting outside investment. I’m always leery to compare Portland to L.A. given the immense size difference. But still. 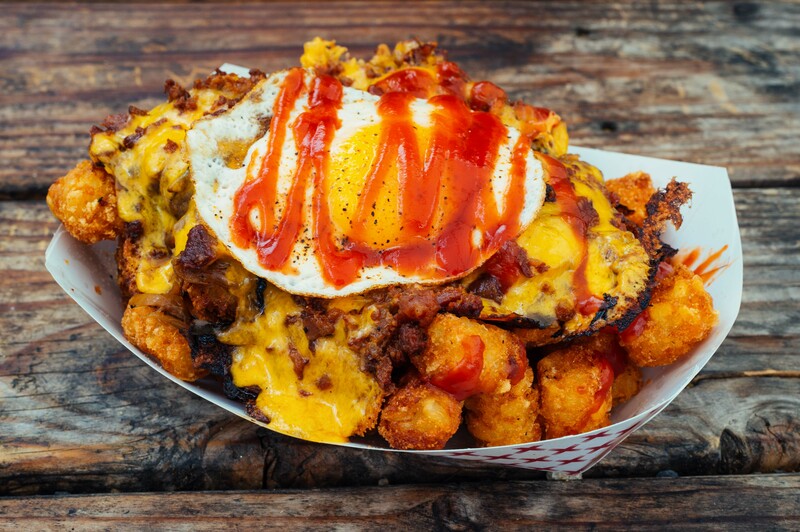 Quasi-related: the tater tots at the Dog House PDX cart at Division and 28th Place are really, really good. If going transit, take the 4 Bus. Tots worth traveling for. Photo: Steve Hymon. •On the drive home I was grazing on my Facebook feed and noticed an update from Streetsblogian Damien Newton commenting that he counted several dozen motorists infringing on crosswalk violations while walking his daughter to school. Sad but hardly surprising — motorists in our region rarely seem to get cited for rolling their cars illegally into crosswalks. I spent a few days around tiny Pinedale, Wyoming — in the heart of cowboy and oil/gas country — and was struck at how alarmingly good the locals were at stopping well before crosswalks. Perhaps apples and oranges. Perhaps not. Perhaps someone drilled into the Pinedale locals that pickup trucks always yield to flesh-and-bone. In fact, Wyoming had just one pedestrian fatality in 2014, according to the Governors Highway Safety Assn. Interesting. 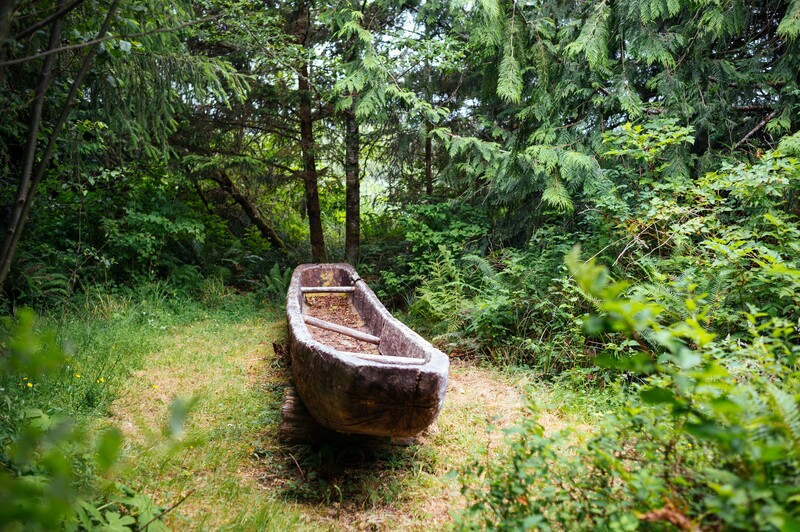 ART OF TRANSIT: Replica of a dugout canoe used by Lewis and Clark and the Corps of Discovery at Fort Clatsop National Historic Park near Astoria, Oregon. The explorers spent the soggy winter of 1805-06 at the fort. While I normally would offer massive hugs to our friends at the National Park Service, I thought the visitor center was just so-so and could have been so much better with some imagination (and $s). Photo: Steve Hymon. Your LA freeway weekend recap: part of the 15 torched by a wildfire; section of the 10 washed out by a flash flood. Metro officials emphasize that cellphone users would have to agree to receive messages. No start date yet but we’ll certainly let you know when something is imminent. Interesting technology that is being used or will be used in a variety of settings, from sports stadiums to museums to airports. The editorial doesn’t like plans by Mayor Bill de Blasio to cap the number of car-sharing vehicles on the road although the NYT concedes that traffic speeds have slowed in recent years. Not a strong editorial IMHO but I think the big point is this: car sharing (as the name implies) vehicles are used by many people versus private vehicles that are used by few. In other words, limiting car sharing may be a short-term fix that overlooks their (again IMHO) vast potential to connect people to jobs, transit and other destinations. Long piece by Jarrett Walker that draws on his book (titled Human Transit). Before we get to the next article, I think the important point here is Jarrett’s explanation that the priority at many transit areas — often at the behest of both elected officials (who oversee the agencies) and riders — is to have the most coverage area. That often means more infrequent buses (and sometimes trains) and lower overall ridership as a result. Which brings us to this bit of news…. Jarrett looks at an ongoing effort at Metro to review the transit system and decide what might work best in the region — more frequent service on fewer overall routes or to cover the most area, even if it means covering fewer overall routes? First, this caveat: the key phrase is “ongoing effort,” meaning ABSOLUTELY NOTHING HAS BEEN DECIDED YET ABOUT METRO BUS ROUTES and there’s a chance nothing may come of this, especially the part about cutting service. That said, it’s certainly interesting that Metro is looking at this, given that some of its bus routes are quite expensive to run due to lack of ridership. I’ve been gone and will be writing more about this next month. In the meantime, I recommend reading both of Jarrett’s blog posts for those interested in this type of thing. It’s certainly an important topic that lands at the same time that ridership at Metro and other agencies has leveled or dipped. Great podcast about the founder of the former Haystack app that was designed to allow motorists to sell their parking spaces to other motorists (with Haystack keeping a cut). Only one problem: while finding a parking space can be tough in many neighborhoods, many cities and residence didn’t like the idea of a private firm (in this case Haystack) making money off public parking spaces. Planet Money does a great job of breaking down the problem, noting that Haystack’s approach wasn’t necessarily wrong, but the execution left something to be desired. A gallery of photos from the new book “Both Sides of Sunset.” As would be expected, there are a few nods toward our car culture, as well as L.A.’s less glamorous side. We’re certainly living in earthquake country — and, as the article notes, the San Andreas Fault is probably the one fault that most Americans know by name. The article, however, focuses on what may constitute the gravest earthquake/tsunami threat in the country — the Cascadian Subduction Zone off the Washington and Oregon coast. Bottom line: many scientists agree that the Seattle area is overdue for a massive 8.0 or greater magnitude quake and one expert predicts the temblor and subsequent tsunami could wipe out everything west of the 5 freeway. Among those quoted, there is widespread agreement that the metro area’s infrastructure — including its roads and rails — is at great risk. A scary read. A catalyst like a transit station is similar to a garden – it can produce great things, but only if you take care of it and give it the nurturing environment it needs. City government did not do that with Garnett. In regard to its potential for spurring growth, it’s turned into a waste of money because of the lack of care taken to give it a proper environment for growth. Here’s what it looks like now, from above. A city that sits back and waits for the market to work is not doing everything it can to help the station fulfill its potential. Imagine what could be here. I include the post here because Atlanta is hardly the only metro area wrestling with attracting transit-oriented development — and there are certainly stations along the Metro system where development near stations is non-existent or lacking. Feel free to follow me on Twitter and Instagram for my non-transportationy thoughts. When comparing number of people with area size, one must becareful to deduct the areas where people cannot live to get the true area size. LA County’s area is 4752 square miles, but that’s including the area taken up by water, surrounding mountains and nature preserves. People can’t live in those areas so our true area size for human population is much lower than that. About 693 square miles is taken up by water between LA and Catalina Island. Additional 1500 square miles is taken up by nature preserves like the Angeles National Forest. The more better way to say it is that LA County has more than 10 million people in an human habitable area size of roughly 2500 square miles. There’s nothing “cray cray” about this. Any person can look up all this info on Google or Wikipedia with cited sources linked to US Census data and what not. One can even say LA County is more populous than the countries of Austria and Sweden. if LA County was it’s own nation, we’ll be the 88th most populous country in the world, just below Benin and a bit more than Hungary. At our population levels, we’re not running a city or a county or a state; the population is big enough that it’s like we’re running our own nation here. Looks like the weekend rain came too late to help those poor folks stuck in Cajon Pass traffic. Yikes! As you may have noticed, Amtrak (with a PRIIA push from Congress) has abdicated its responsibility to provide ‘placeholder’ intercity service until the states can pick it up. The current CEO only cares about the North East Corridor aka NEC aka Nothing Else Counts. Several LA-LV rail alternatives to replace the defunct Desert Wind have fallen down. A restart of the DW will require CA and NV to discuss, negotiate and agree on allocation and payment of subsidies ………. riiiiiight. As far as ‘beacon technology’ use at LAUS, Why can’t Metro put up some more decent signage first? – Recently I had to help a non-English speaking couple navigate the complex to the Bus Plaza for their LAX Flyaway connection. I could be wrong, but I remember no signage along the passenger unloading sidewalks in front. – The Red Line entrance needs A BIG EFFING NEON SIGN, not the current non-lighted, semi-hidden (but tasteful) Art Deco one. The lighted signs for the new retail booths distract one from the transit related signage that new / infrequent visitors need. If LA County is so populous that it’s just like running a nation, then LA County should just merge all the 88 cities and unincorporated areas into one big city-county and work together under one single entity. The bureaucracy is too confusing here that no one knows what’s going on. This region cannot function properly with 88 cities all trying to do things their own way with each of them electing their own mayors, city councilmembers, government bureaucracy, police chiefs, etc. etc. Do we really need cities like Vernon, Cudahy, San Fernando, Santa Monica, all trying to do things their own way, each with their own mayor, councilmembers, their own police, their own bus system, etc. etc.? It’s ridiculous. At 10 million people and 88 cities under one county, it’s not even “small government” anymore. It’s just a collection of tons of “small governments” with a result being a chaotic big government under one county that can’t get anything done because everyone is arguing with each other with their own stupid set of laws and regulations.